Blend, mix or shake 1 rounded scoop (43 g) with approximately 8 oz (250 ml or 1 cup) of water or low-fat milk depending on desired taste and consistency anytime you want a premium satisfying high-protein beverage. ALLERGEN WARNING: Contains Milk (Whey), Peanuts. Produced in a facility that also handles egg, peanuts, tree nuts, fish, crustaceans and shellfish products. Whey Protein Concentrate, Whey Protein Isolate, Lecithin (Soy). 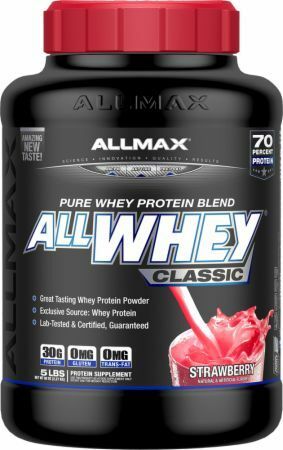 May 25, 2016 ALLMAX AllWhey Classic: No-Nonsense Whey w/ Scoop on Top! French Vanilla This is a Buy 1 Get 1 FREE offer!